Are Western and Gulf oil interests ganging up to break Russia? Is the country hopelessly addicted to black gold? Bryan McDonald find the truth is a bit more prosaic. The last time Russia faced financial ruin was in August 1998 when the rouble collapsed against the dollar after President Boris Yeltsin's administration defaulted on domestic debt payments and froze repayment due foreign creditors. Within the space of a few weeks the rouble exchange rate against the dollar collapsed from around six to 21. Ordinary people, who kept their savings in roubles or who had dollar denominated mortgages and loans, faced ruin. And yet, in a country that is no stranger to crises, within a few years the Russian economy was booming as never before with annual growth in double digits. When Vladimir Putin took power in 1999 he was faced with a state that was spiralling out of control, struggling under the weight of a failed neoliberal economic experiment. Already humiliated by the collapse of the Soviet Union, poverty-stricken Russia was in an execrable state. Putin stopped the rot with a simple yet effective 13 percent flat rate income tax that went a long way to tackle a culture of mass tax avoidance Later, he re-nationalised key industries and broke the back of the 90’s oligarchs. Right on cue, due to external factors, oil prices began to rise and the Russian Phoenix spread its wings. Just as it looked like goodnight Moscow, the country stepped back from the brink. Is it now possible that the Kremlin’s attachment to the wonders of black gold could be its undoing? Are outside players exploiting the country's dependence on oil revenues to break it? Neither notion is convincing. First, the bad news: Moscow Washington relations are at the lowest point since the Brezhnev era of the 1970s. Capital flight from Russia is at record levels and is forecast to reach $128bn this year. Economic growth has stalled at close to zero. That’s sobering for a country that once had double-digit growth and more recently was stable at around 4 percent while rivals stood still or declined. And the rouble is in free-fall against foreign currencies. Europe is also suffering and will likely eventually be forced to insist on the lifting of sanctions that barely affect the US but are damaging EU economies almost as much as they hurt Russia. Britain's robust mid-summer rhetoric over Russia's actions in the Ukrainian crisis has mellowed. David Cameron has more to be worrying about right now than Ukraine and Putin. His Tory party is pulling itself apart over Britain's relationship with the EU and the rise of right-wing anti-Europe party UKIP is spooking him. Not to mention lingering tensions in Scotland and an English public jaded by austerity. The rouble collapse scares Russians. The new middle class have become accustomed to their annual foreign holidays, unthinkable not so long ago. Thailand, Turkey and Spain are among the top destinations for Russians, mirroring British and German tourist colonisation of Spanish and Greek beaches 30 or 40 years ago. Sergey and Svetlana public are understandably distraught at the prospect of replacing Alicante for Crimea's Alushta, Nimmanoradee with Primorky Krai's Nakhodka. And it is a two-way street; tourist resorts will be reeling at the shock of losing Russian custom. Many top British 'public' schools, expensive fee-supported institutions, depend on Russian students to cover costs. Contrary to popular perceptions, not all scholars are scions of oligarchic families. The vast majority have middle-class, professional parents. With sterling over 70 against the rouble and rising, the British private education sector is justifiably alarmed. As for oil prices, the idea that it is a nefarious US/Saudi conspiracy to bring down Putin's Kremlin is nonsense. Plunging pries for crude are a consequence of a boom in shale oil in the US and falling demand in China and Europe. If the Saudis were scheming, ISIS would be their target and Russia’s turmoil would be a lucky side effect from their perspective. 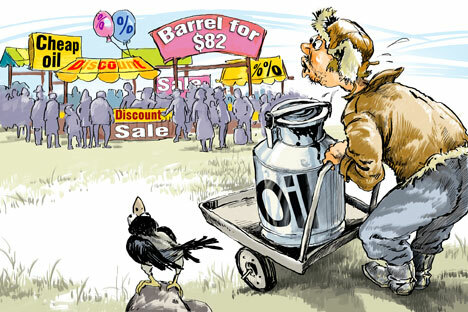 Riyadh has sufficient cash reserves to keep the price of a barrel around $80 for some years to come. As ISIS sells its oil at a large discount, low prices mean that they can’t cream off a profit at the wells they control in Syria and Iraq. Less revenue means less firepower for their ‘Holy war’. Russia’s problem is that Urals Crude has dived from $115 to $83 a barrel since June. Deutsche Bank claims that, due to sharply increased spending in recent years, Moscow needs $100/barrel to balance its budget. The Kremlin’s failure to diversify the Russian economy could be coming home to roost now. However, there are reasons to believe that to a certain extent Russia can dodge the oil bullet. A falling rouble may be a disaster for ordinary households, but it has a positive impact on the Russian government's budget because income from oil is in dollars and domestic expenditure in roubles. This eases the pressure of the Kremlin's coffers. And the Saudis aside, other Middle Eastern oil producers can’t sustain lower yields over a period of years. Russia has healthy cash reserves and can bear the economic pain for a while yet. The US shale boom, which is keeping unemployment there in check, can’t cope with prolonged exposure to sub $90 prices. In the UK, the average household currently spends £2,256 a year on petrol for the family car. Even a short-term drop in costs at the pumps would free up enough cash to spark a consumer boom there. British finance minister, George Osborne is also keen to bring fracking for shale oil and gas to England’s northern regions. A side effect of a protracted collapse in oil values would be the pricking of the shale bubble. Good news for environmentalists, utterly unwelcome for domestic energy firms. Bryan MacDonald is an Irish journalist who focusses on Russia and international geopolitics.